I have to change my EGR valve on my S10 4x4 4.3L Vortec FI and I cannot locate the EGR Valve for the life of me. I found it on my other S10 that is 2 years younger but I can't find it on the 2002. Can you help at all? Some of these engines did not have an EGR in 2002 but if it did it would be in the diagram below. The 4.3L engine's EGR valve is located on the top, front of the engine. 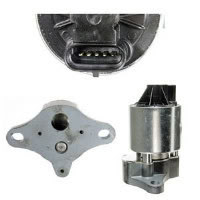 EGR valve is pictured below.. If you need replacement procedures just let me know..
You can give me your engine's ID code if you would like and I can look it up to see if it matches the 2002 S-10 4.3L engines. The 4.3L engine identification number is located on the left side rear of the engine block or on the right side rear and typically is a 9 digit number stamped or laser etched onto the engine. If it isn't there, it is probably not the original engine to begin with, but you can search for the ID code in another area so I can double check with the list of codes for the 4.3L engine. I will do my best to find the Number but If I can't due to parts being in my way, can you use my VIN num. To check the codes you need to check? Its stock and hasn't been worked on by anyone since I bought it new from the dealer. Oh, well if you are the only owner then the engine is correct engine. You must be overlooking EGR valve? Maybe there is another small component hiding the valve? Is the engine code on showing that EGR is faulty? My EGR valve that I bought looks like the one below. My codes have not come up for it yet but after replacing the plugs, wires, cap, and coil I did research and found that the EGR can get stuck open and make the truck run like it has an oversized cam (which it does and gets about 10 MPG) so i just got the Valve and Gasket. Sorry about that, the one I posted was just a basic egr valve shown. Your picture is the correct one for your vehicle. 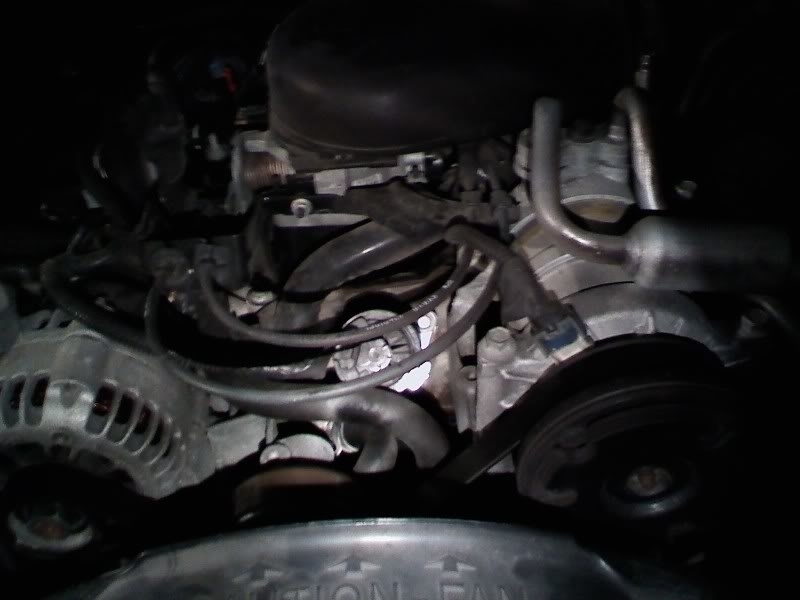 Without being able to see your engine I really can't help you locate it if it isn't where it should be. 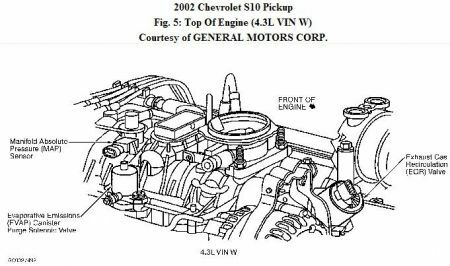 Perhaps a call to your local Chevrolet dealer may be able to help as to where it will be if it isn't on the top front of the engine as it should be. Or if you have a digital camera you can take a pic of where valve should be compared to the diagram and post it or email it to me? 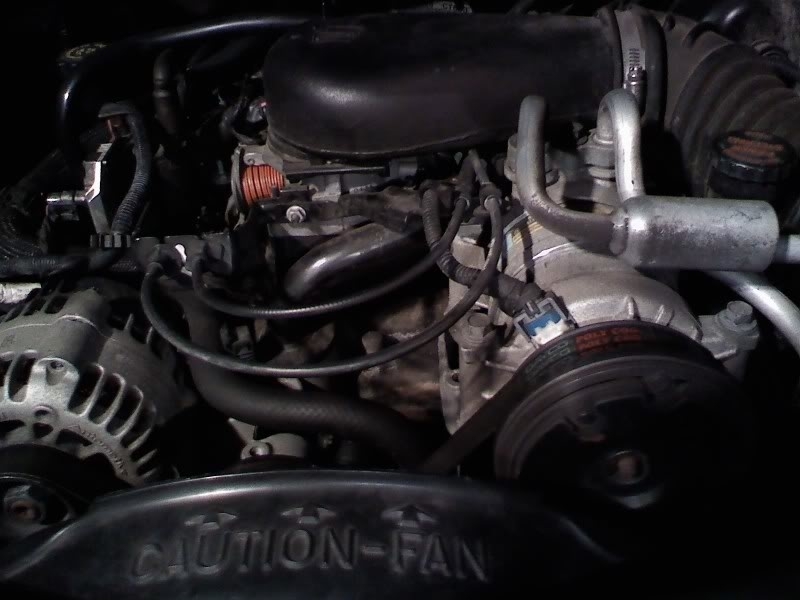 - Notice the EGR off the the right of the alternator (its kind of shiny in the 2002 pic but its not in the same spot on the 2000. Yes, but I meant a pic of your actual engine so I can see what the area looks like where the EGR should be. So your asking for a picture of the whole engine bay to try to see if you would know where the EGR valve is? (Correct?) Because the valve should be in the blank spot in the 2000 pic. Okay, I am confused now. Your vehicle you have listed is a 2002 model. You have the 2002 pictured WITH the EGR valve. You are saying that the 2000 model is the one without the valve now? Clear me up a little please? I will trace the vacuum hose from intake to the valve in vacuum diagrams once I know which model it is. I'm sorry that was my fault. The top pic is my truck that I need to fix the EGR and its the 2002. The bottom one is the truck that has the same engine but has the EGR is plain site right where the diagram and sent had it located. So the top one is the one that has the problem. Sorry I get confused too. Good luck I traced hoses and wiring all night haha. Isn't that a bolt hole behind the hose in the pic same place as 2000 model? Looks like it is just gone? There is one on the mount below the top pully but nothing in the shape on the valve. Wouldn"t there be two hole to mount the valve and two for the valve to do its thing. Oh okay, sorry hard to tell from the pic. You may need to call the dealer and give them your VIN to see if they can tell you where it is at because all of my sources list it in the same spot, sorry. I do know that not all vehicles are equipped with the EGR valve but I would think that the S-10 would have one. Oh okay, sorry hard to tell from the pic. You may need to call the dealer and give them your VIN to see if they can tell you where it is at because all of my sources list it in the same spot, sorry. I do know that not all vehicles are equipped with the EGR valve but I would think that the S-10 would have one. " I am having the same problem, and my engine looks the same as the photo you posted. I also called my dealer and gave them my VIN number but they couldn't tell me where the EGR valve is located, so I was wondering if you could tell me where you found it? may or may not have egr. had no egr, my guess is you have no egr. Do you know what the trouble code turned out to be? I have an 02 Chevy s10 4.3L that has no EGR. Check engine light has been on for months and cannot figure out what the problem is. The code says too lean bank 1, bank 2. Have changed 02 sensors, MAF sensor, all 6 injectors, fuel pressure regulator, upper and lower intake gaskets, new fuel pump, full tune up. Chevy, my mechanic and other reputable shops can't figure out what the problem is. I need to replace it for a miss fire, but I cannot locate it. Are you sure it is EGR? best thing on misfires is let a pro do it because of how many things can be bad computer wise they can freeze frame it and check it from there. also a vacuum leak and low fuel pressure will cause a misfire as well. auto parts rent gauge and it should be 60-66psi key on no lower or wont run.